To access specific issuances, go to our Top Stories section, where you'll find links to all the relevant documents. PATRIOT OFFICER automatically calculates risk scores for each customer to identify higher-risk customers and monitors them more closely as the regulations mandate. The solution automatically detects check fraud, check kiting, deposit fraud, ACH fraud, wire fraud, Internet banking fraud, credit/debit card fraud, ATM fraud, employee fraud, and financial fraud to prevent losses. 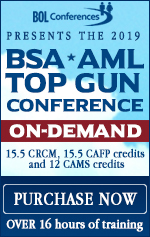 PATRIOT OFFICER is the only BSA/AML/FRAUD solution endorsed by American Bankers Association. FinCEN has announced the assessment of a $36,350 civil money penalty on Eric Powers for willfully violating the Bank Secrecy Act's (BSA) registration, program, and reporting requirements. Powers, who operated as a peer-to-peer exchanger of bitcoin convertible virtual currency, failed to register as a money services business, had no written policies or procedures for ensuring compliance with the BSA, and failed to report suspicious transactions and currency transactions. For additional information, see BankersOnline's penalty posting, "P2P virtual currency transmitter fined for BSA violations." In this case study, you'll learn how Verafin boosted Bell Bank's ($5.4B) confidence with extra scrutiny for identifying and managing high-risk customers, as well as the success they are seeing with Verafin's targeted Wire Fraud analytics for real-time loss prevention. Whitepaper: Are Financial Institutions Prepared for CECL? For the third year in a row, Abrigo surveyed 125 individuals at a wide range of financial institutions to gauge CECL preparedness. The 2019 survey shows that as the Q1 2020 compliance date looms for SEC registrants, institutions of all types are making progress — but not enough, according to CECL experts. The Federal Reserve, FDIC, and OCC are requesting comment on a proposal to modify a capital requirement for U.S. banking organizations predominantly engaged in custodial activities, as required by the Economic Growth, Regulatory Relief, and Consumer Protection Act (EGRRCPA). Risk management and compliance requirements are necessary but challenging and complex areas for companies to manage. 360factors' free guide is specifically focused on and explores the top risk management initiatives that many small and mid-sized banks and financial service companies expect to implement and/or improve in 2019. Click for your free guide. An increasing reliance on data to carry out various tasks has put a focus on data management in recent years. Listen to our webcast to learn how to use data governance and management to address challenges specific to BSA/AML and Sanctions compliance groups. CFPB Director Kraninger has announced a symposia series exploring consumer protections in today's financial services marketplace. The series is aimed at stimulating a proactive and transparent dialogue to assist the Bureau in its policy development process, including possible future rulemakings. During each symposium, the Bureau will host a discussion panel of experts with a variety of viewpoints on the topic. The first topic for the series will focus on clarifying the meaning of abusive acts or practices under section 1031 of the Dodd-Frank Act. Additional details on dates and panelists will be forthcoming. Press>PLAY - allows you to choose precisely what you want to learn, pay for just that program, and Press>PLAY to watch instantly, share with fellow employees of your institution, and keep watching any time you want during the 90-day period after purchase. Hundreds of programs to choose from - including unique programs and exclusive instructors you will find only on BOL Learning Connect. Any device. Any time. Any program. Support the vendors who support BOL!